PokerMaster is a Chinese oriented poker room significantly different from others. 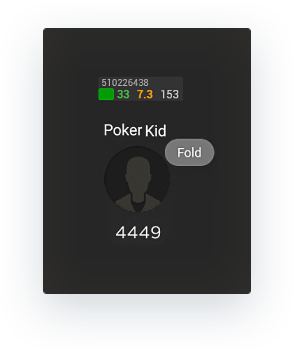 Now you are able to play high stakes poker with fat fishes and weak regulars with Hand2Note HUD. Please note, the current version of the HUD on PokerMaster is in a beta stage. PokerMaster client works only on Android and iOS smartphones. The lowest stakes are NL 400¥ (1$ = 6.6¥) with ante and deep stack sizes. The highest stakes are NL 60,000¥ (approx. NL10,000$). Registration is available only through specialized affiliates. You can't register and play directly. Multitabling is possible and officially allowed using with the use of emulators. Most players are chinese. A lot of very weak players. Convenient and relatively stable software. We succeeded to develop the first HUD working on Android emulator. All you need is to start Hand2Note and emulator. High perfomance and full set of powerfull tools is available for you in Hand2Note itself. Advanced note taking system, fully customizable statistics, reg-vs-fish spots exclusion, advanced popups etc. All you to need is to start Hand2Note, emulator and login into the poker room. Positional and Dynamic HUD support. 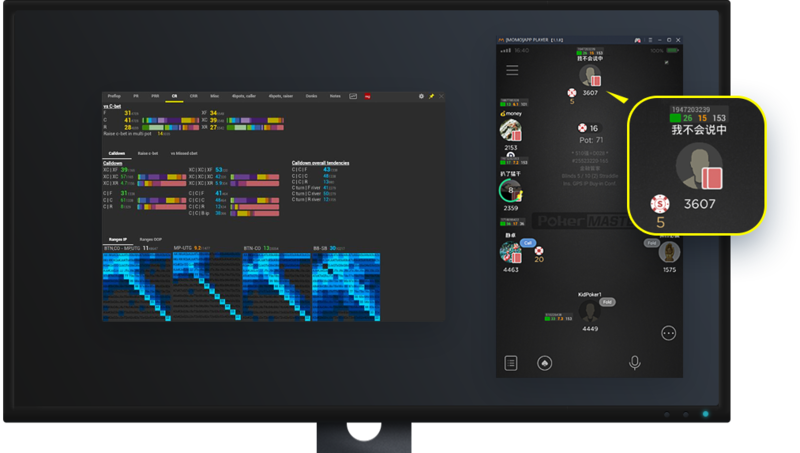 Gather hand histories in Observer mode. Is this HUD officially allowed on PokerMaster? Currently the PokerMaster managment position is not determined. However there is no technical way to detect that you use our software. Which emulators do you support? Other emulators probably will work too. If I bought EDGE subscription do I need to buy anything else to use HUD at PokerMaster? Yes, you need to buy PokerMaster STANDARD or HYPER subscription to use HUD on PokerMaster even if you have EDGE subscription. What are the first steps to start HUD on PokerMaster? 1. Install Hand2Note 3.2.1.130 or higher and start it. 2. Start the Android emulator. 3. Login into PokerMaster, i.e. enter your credentials. 4. Open any active table and HUD should be immediately shown.